Today a friend gave me a wonderful gift — a mask made by an artist named David Lockard, whom I have never met. But it is not just a mask. It is meant to be a “skin” for a virtual reality headset. As you can see below, this virtual look is quite attractive on me. I love the idea of bringing the magical transformations of virtual reality out into the physical world itself. After all, we already live in a society in which the boundary between the real and the virtual is being erased on all fronts. Might as well have fun with it. Someday, a few years from now, there will be no need for such a mask. I will be able to wake up in the morning and decide that this is what people will see that day when they look at me with their cyber-enhanced eyes. 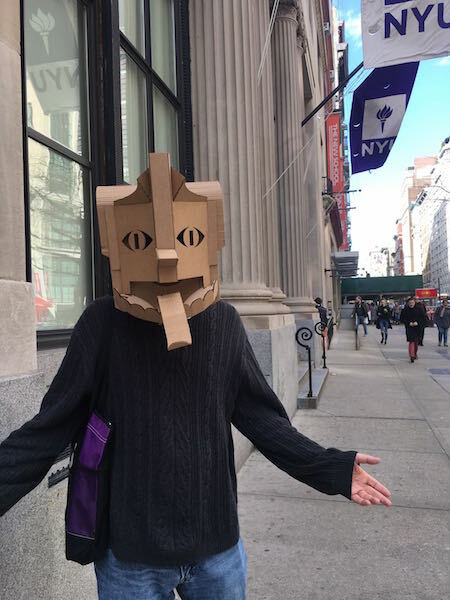 And if all goes well, whoever makes the software will even manage to make my virtual mask look like real cardboard. This entry was posted on Thursday, March 9th, 2017 at 5:48 pm	and is filed under Uncategorized. You can follow any responses to this entry through the RSS 2.0 feed. You can leave a response, or trackback from your own site.